A report highlighting the systematic nature of teaching and the development of language use in explaining our purposes and activities. Responding to the inmost longing of every heart to commune with its Maker, [thousands upon thousands, embracing the diversity of the entire human family] carry out acts of collective worship in diverse settings, uniting with others in prayer, awakening spiritual susceptibilities, and shaping a pattern of life distinguished for its devotional character. A believer from the South who has been holding a regular devotional gathering explains how her choice of language has shifted in more recent attempts to describe these gatherings to friends and neighbors. This shift in language, she explains, is due to experience that has been gained from communities that are practicing the core activities. I was calling it a ‘devotional’. each time has a theme. [The purpose is] ‘to pray together’–it kinda of felt like ‘church’. talk about common spiritual interests, like ‘gratitude’ or ‘being fearless’ or ‘friendship’. Also, we read from uplifting poems, quotations, and have music. I’ll provide everything: refreshments, music, quotes, home. Even though I wanted folks to play music, bring quotes, etc., it was still mostly ME being in the center. I believe it’s important that no one person is in the center, that the spirit is in the center, and our love for each other. The vision is that additional folks in our neighborhood will arise to offer a weekly or monthly devotional. They may just do it, or they may like to have training [on] how. The course called Reflections on the Life of the Spirit provides the training. I’d like to start one in Oct. or Nov. on a Friday if there is interest. I probably will not announce this at the get-togethers, but will talk with guests one-on-one. Monthly devotional only–a stand-alone activity. 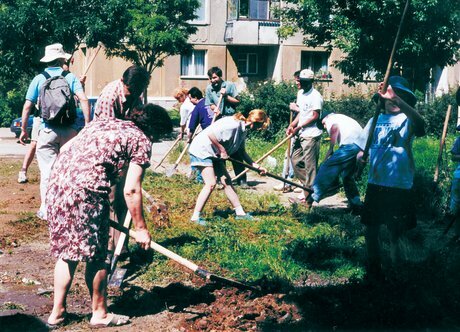 Focus on additional activities and service projects to bring neighbors together for the good of our families, each other, the neighborhood, and the environment. [For instance through] the Junior Youth empowerment program. I’m going to see if there is interest in being of service with: Creek clean-up, erosion prevention of the creek, water catchment for the neighbors who live here, plus input and ideas and involvement from everyone will be welcome. [T]heir teaching efforts [represent] a process that seeks to raise capacity within a population to take charge of its own spiritual, social and intellectual development. The activities that drive this process, and in which newly found friends are invited to engage—meetings that strengthen the devotional character of the community; classes that nurture the tender hearts and minds of children; groups that channel the surging energies of junior youth; circles of study, open to all, that enable people of varied backgrounds to advance on equal footing and explore the application of the teachings to their individual and collective lives—may well need to be maintained with assistance from outside the local population for a time. It is to be expected, however, that the multiplication of these core activities would soon be sustained by human resources indigenous to the neighbourhood or village itself—by men and women eager to improve material and spiritual conditions in their surroundings. A rhythm of community life should gradually emerge, then, commensurate with the capacity of an expanding nucleus of individuals committed to Bahá’u’lláh’s vision of a new World Order. [T]he task before the friends this coming year is to teach within one or more receptive populations, employing a direct method in their exposition of the fundamentals of their Faith, and find those souls longing to shed the lethargy imposed on them by society and work alongside one another in their neighbourhoods and villages to begin a process of collective transformation. What wonderful ideas. Do you have an invitation card that you can share?